Change management is about effectively managing change so that all of the parties it affects, are comfortable through each stage of the transition and at the end of the process. This encompasses change that is either, planned, emergent (unplanned) or incremental (continual). It is usually change that will correct failings in existing procedures or enhance existing procedures. Continuous change often responds to the changes in the environment in which the organisation operates e.g. staff turnover. This is change where the organisation aims to achieve a set goal so this type of change is planned, episodic and radical. Episodic change is change that occurs infrequently, usually involves substituting an existing program or plan with a new one and is a change that is intended by it’s implementers or the organisation’s decision makers. Often it will not fit into existing or new strategy, in other words it is discontinuous. This will lead to an organisation that is very different to the organisation that existed prior to the change. As the change is very radical the organisation and it’s employees will need to radically change their views, strategy and assumptions. Such change can alter an organisation’s culture, ethos and systems. Lewin believed that people are comfortable with their existing state of fairs and are frozen in that comfort. In order to move them towards change they need to be unfrozen so that they are ready for change. 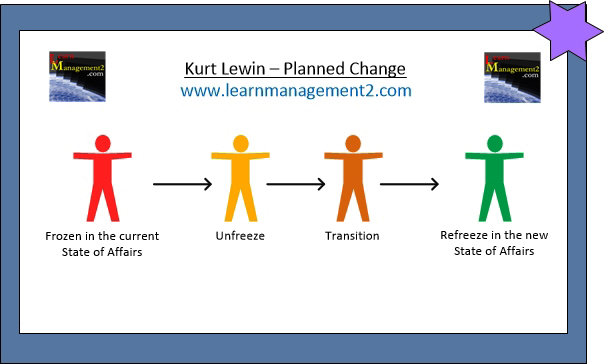 After unfreezing, Lewin said that they need to embark on a transition journey which results in change and people may need support through this transition period to ensure they complete the transition and make the change. Once a person has successfully made the transition to change they will need to refreeze. Refreezing involves nesting, laying down roots and regaining the stability experienced prior to the change. Without refreezing the change will not last. Through refreezing the change will become a permanent part of the organisation.